Caramel-like nose with a hint of spicy hops, fruitiness, and a bit of yeasty depth. Very malty up front, then building to a gentle tastiness with moderate bitterness for a pretty even balance. The beer smells good. I have always been a big fan of Bell’s. I REALLY like their seasonal beers; of course, the beers I can’t get anytime I want them. And it always works where I want one when I can’t get one! Anyway, moving on to the Bell’s Amber Ale. I like ales, the pale ales especially. But after pouring this into a glass, it doesn’t appear to be as dark as a good pale ale. It’s not a pale ale though, it’s just an ale. Too many ales going on here. The nose and the head on this beer are pretty consistent. The drinkability is solid too. Most pales have a bitter, almost thickness to them. This beer drinks like a domestic with a bit of punch toward the back of the palate. I would drink this beer with dinner, perhaps on the back porch while reading a book. (I really should read more than I do.) It also leaves a good aftertaste. I wouldn’t call it a strong aftertaste, just a lasting and comfortable one. Try the beer, it will make sense! I wonder how this would taste on tap… most beers taste different on tap. Not saying they taste better, just different. Man, that aftertaste just isn’t going away. Bravo Bell’s! The first beer that comes to mind when I think of Bell’s is their Oberon. I’ve not had many of their others, but today we are trying their Amber Ale. I like the way it pours out… nice orangey color, very carbonated with lots of bubbles. I’m a big fan of porters, stouts, and dark beers, and honestly, unless it’s an IPA I don’t usually favor too many ales. But this one is different. I really love the color. Is that a silly thing to say about a beer? I hate the urine yellow of most domestics, so this is a nice change. The smell is pretty good too… just a good, flavorful beer scent that carries over into the taste as well. I think I would declare this as a good every day beer for someone like me that’s not into domestics much. It’s got a great taste without being heavy, a nice somewhat nutty flavor that makes me want to keep drinking. 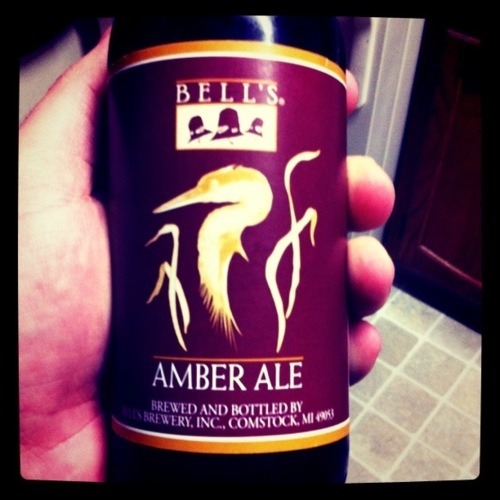 I will definitely keep Bell’s Amber Ale in mind next time I am out and just want to pick up a six-pack to enjoy at home.